Sarah draws her inspiration from what is right outside her door. Seascapes, landscapes, the Everglades, pink flamingos, ripe oranges, swaying palm trees – they all find their way into her lush thick paint canvases. Following in the thick paint footsteps of her artist/musician father, Palm Beach Gardens native Sarah La Pierre grew up learning from and helping her father in his studio. Her father was a successful touring musician when he met her mother on a beach in New Jersey, she was a model studying to be a nurse. They married and eventually settled in Florida where Sarah was born and he saw the paintings made by The Highwaymen, a group of self-taught landscape artists. 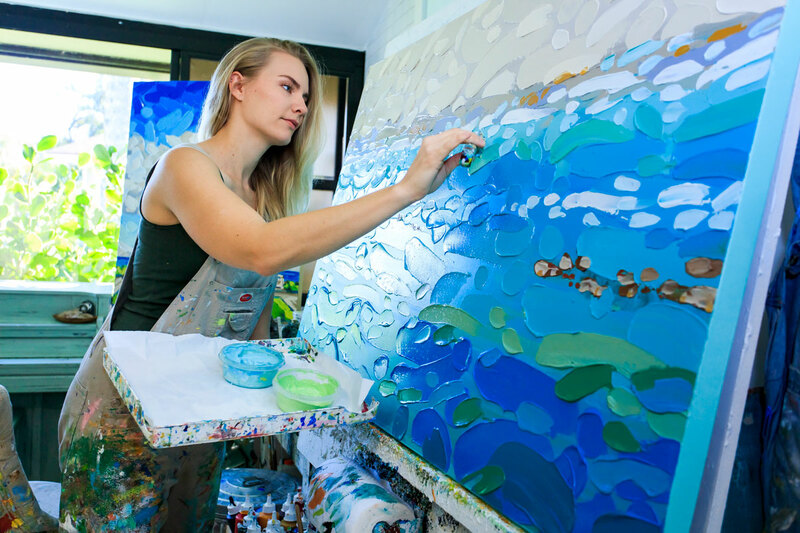 “He became really prolific making these paintings, up to four a day, I still have several of them hanging in my house here,” she says, pointing to some vibrant landscapes. Sadly he passed away in his early 60s in 2009, but Sarah continued her art education at Palm Beach State College. She draws her inspiration from what is right outside her door – the bright sun splashed flora and fauna native to Florida. 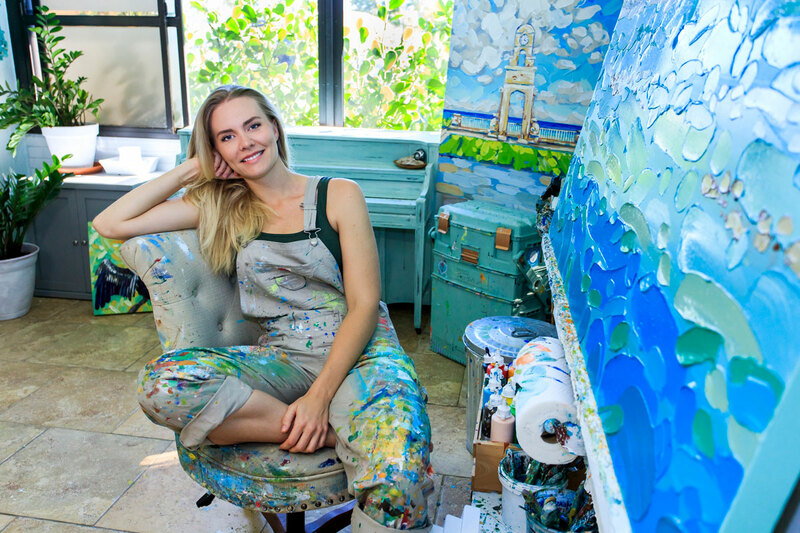 Seascapes, landscapes, the Everglades, pink flamingos, ripe oranges, swaying palm trees – they all find their way into her lush thick paint canvases. La Pierre works from a large tray to hold generous amounts of paint and generally finishes a piece the same day she starts it. Then she’s into the sunny large studio off her kitchen to paint until about 6 p.m. Some new murals in downtown West Palm Beach are in CityPlace’s garages. They include “Growing Good,” a three-part series by LaPierre, with a flower for each of the garages, Hibiscus, Gardenia, and Sapodilla. 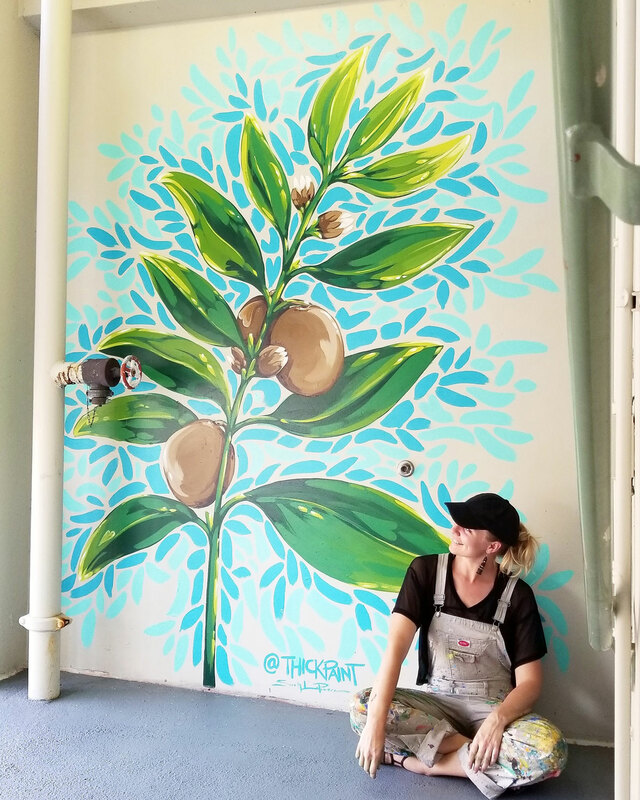 “Growing Good” was her first solo mural. Sarah LaPierre exhibits at fine arts festivals throughout South Florida and most local events in Palm Beach County. For more information on obtaining prints or paintings, or upcoming exhibits, visit sarahlapierre.com.